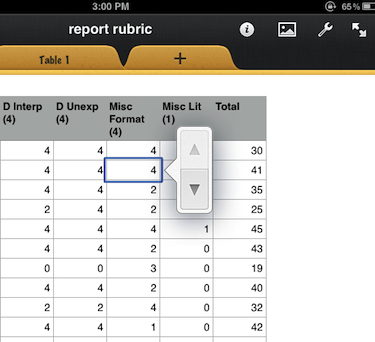 One of the best ways I’ve found to keep my sanity with grading is to use a rubric whenever possible. This means that, for each student, I would print a rubric and fill it in with comments and notes, and that is not in keeping with my desire to move away from paper as much as possible. Besides, this information is so ephemeral that it hardly rises to the importance of archiving on paper. No, this is definitely a job for electrons, and that puts it in the realm of the iPad. I started by looking for grading rubric apps in the App Store, but didn’t find anything that struck me as useful for my particular purposes. I thought about making a PDF of the rubric and annotating it for each student on the iPad, but I would end up with a file to manage on the iPad for each student and would still have to enter scores into my grade sheet. So I decided to use Numbers to create a simple rubric. I made each column a different criterion, and entered student names in rows by copy/paste from my grade sheet. 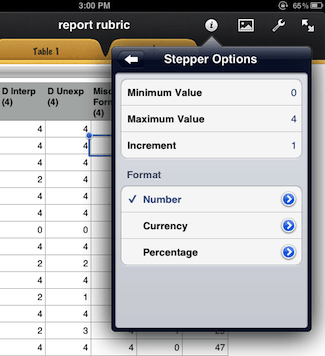 The stepper format allows you to define a minimum and maximum value and an increment. Once set up, you can just tap an ‘up’ or ‘down’ arrow next to the cell to assign points, and you don’t fill half the screen with the on-screen keyboard. Nice. After I scored all the lab reports, I needed a way to distribute them electronically to the students. I decided to merge the students’ scores onto a copy of the rubric, so I set up a Pages document on my Mac with the Numbers spreadsheet linked as the merge source and ran the Mail Merge. Then I sent each student a PDF of their scoresheet. This has become my primary system for scoring papers with a rubric. I really like the ease with which I can enter a score for each category with a few taps, it allows me to keep focus on the paper. For a large rubric, it’s essential to freeze the header row and column so I can continue to see the criteria and student name, but this introduced a gotcha when I tried to configure merge fields, because a header column cannot be a data source. I got around this easily by copying the names into a non-header column, but it was one more step than I expected. While grading one student’s work, I recognized I had been recording the scores in another student’s row, but a couple taps on the ‘Undo’ button recovered the lost values. The last comment is that it was a real pain to send each student a PDF attachment, manually, by email. For now though, the alternative of using our LMS is an even worse prospect!